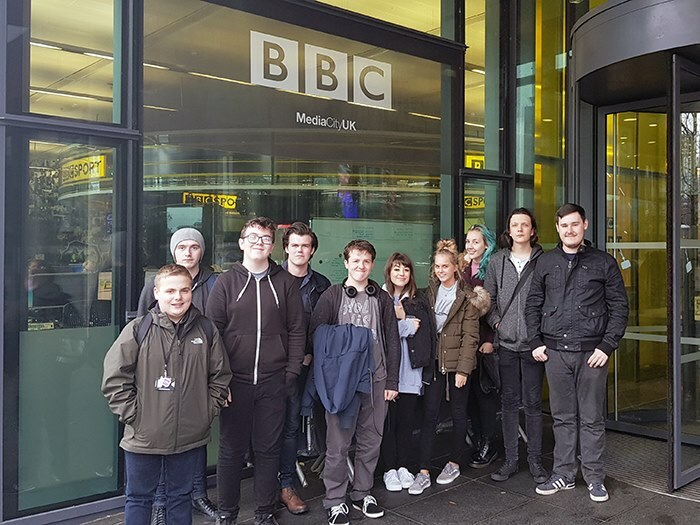 Media students at Clarendon Sixth Form College had a day of excitement and learning at the BBC’s ‘innovation day’ at MediaCityUK. The event, hosted by TeenTech, gave students the chance to experience working life at the BBC. The students visited the ‘blue room’ which houses an exhibition on the future of media technology including virtual reality and were given a talk by the corporation’s technology experts. They also toured the studios, including the set of BBC Breakfast and had a Q&A session with software engineers and digital forensics experts. TeenTech is a not-for-profit company which was founded by Maggie Philbin CEO, who led the day’s events. They aim to give young people the opportunity to find out more about and experience careers in STEM (science, technology, engineering and maths) subjects. To learn more about media courses at Clarendon Sixth Form College, call 0161 908 6800.